Art can be enjoyed by everyone, and everyone can enjoy making art. We aim to inspire artists to broaden their creative activities and experiment with different materials and tools, to inspire people to make their own art and to help beginners to achieve results that encourage them to continue. You don’t need to spend a fortune to try something new. Our Acrylic painting Set, launched in January 2018, is the first product in our range. You will have twelve colours to play with. 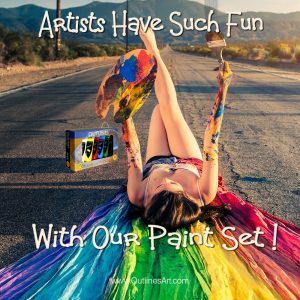 You can try different painting techniques, painting on different surfaces and mixing colours. You will even be able to buy extra supplies of white on its own for mixing with your colours. We’d love to hear about your Acrylic painting projects and see your work, so try them out and let us know about your progress. As well as our own brand of Outlines Art Materials we show our customers complementary products by other brands so that all can enjoy a full experience. Outlines has been helping people to enjoy their pictures for for over 30 years. We have framed pictures for art lovers, artists and photographers, exhibited paintings and prints in our gallery and even helped artists with their own websites. In 2005 our move from London to Devon made us less accessible to visitors and the gallery was changed to online only. The art gallery can be seen at outlines.org.uk. We were inspired to branch out into producing our own brand of paints by established artists we know, and by beginners visiting our studios. We were asked to come up with something that would be affordable and usable for all, without compromising on colour or quality. We would like to extend a huge ‘Thank You’ to all who helped in our research to get it right. You are the true stars! Email: Varies depending on the nature of your enquiry. Please go to our Contact page for details.